The pre-laying exodus (PLE) is considered a crucial period in the breeding biology of Procellariiformes as it determines the success of egg production within a season and, therefore, a population’s reproductive output. However, it has scarcely been studied compared to other stages of the annual cycle. 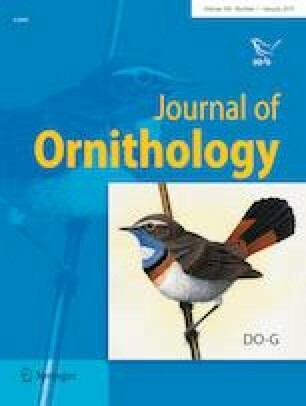 Here we present the first pre-laying tracks of the vulnerable Yelkouan Shearwater (Puffinus yelkouan) through the Global Positioning System tracking of birds breeding on the Maltese islands in the Central Mediterranean, and compare PLE core utilisation areas to known areas used during the chick-rearing period. Females spend, on average, 13 days foraging during egg development, reaching an average maximum distance of 325.5 km from their breeding colony to forage at offshore areas mainly south of the Maltese islands; these journeys are of longer duration and cover a greater distance than those undertaken by males, and by females that are not developing an egg, during the same period. There is little to no overlap between the PLE core utilisation areas and those used during chick-rearing by the same populations. This confirms our expectations that the PLE differs from foraging trips undertaken outside of the egg development period. Our results highlight the need for more research into the factors attracting egg-producing females to the PLE foraging areas and the importance of trans-boundary marine protection for the conservation of vulnerable seabirds. Der Pre-laying Exodus (PLE)—das Verlassen der Kolonie vor der Eiablage—wird als ein kritischer Zeitraum in der Brutbiologie procellariiformer Seevögel angesehen, weil er den Erfolg der Eiproduktion und damit die Reproduktionsleistung einer Population maßgeblich mitbestimmt. Allerdings wurde er im Vergleich zu anderen Phasen im Lebenszyklus der Vögel bisher wenig untersucht. Wir stellen hier die ersten GPS-Tracks von PLE-Bewegungen des gefährdeten Mittelmeer-Sturmtauchers (Puffinus yelkouan) von den Maltesischen Inseln im Zentralen Mittelmeer vor und vergleichen die Nutzungs-Kernzonen zwischen den Phasen des PLE und der Jungenaufzucht. Während der Eiproduktion verbrachten die Weibchen im Durchschnitt 13 Tage mit der Nahrungssuche und erreichten eine durchschnittliche Maximalentfernung von ihrer Brutkolonie von 325, 5 km, einen längeren Zeitraum und eine weitere Entfernung als Männchen und als Weibchen die im selben Zeitraum kein Ei produzierten. Innerhalb der Populationen, fanden wir fast keine Überschneidung zwischen den Nutzungs-Kernzonen während des PLE und der Jungenaufzucht. Diese Ergebnisse bestätigen unsere Hypothese, dass PLE und Nahrungsflüge außerhalb der Eiproduktion grundlegend unterschiedlichen Strategien folgen. Unsere Ergebnisse unterstreichen den Untersuchungsbedarf von Faktoren, die die Weibchen während der Eiproduktion zur Nahrungssuche in die PLE–Gebiete bringt und heben die Bedeutung von grenzüberschreitendem Meeresnaturschutz für den Erhalt gefährdeter Seevögel hervor. We thank Edward Jenkins, Juan S. Santiago, Antonio Vilches, Nancy del Carro, John J. Borg, and volunteers for assistance in the field, and Maria P. Dias for assistance with the mIBA protocol. We would also like to acknowledge two anonymous reviewers for their constructive feedback. This study was carried out as part of BirdLife Malta’s EU-LIFE + Malta Seabird Project (LIFE10NAT/MT/090) and EU-LIFE Arċipelagu Garnija (LIFE14NAT/MT/000991), both co-funded by the LIFE programme of the European Commission and the Maltese Ministry for the Environment, Sustainable Development and Climate Change, in partnership with the Royal Society for the Protection of Birds, the Portuguese Society for the Study of Birds and Transport Malta. We dedicate this work to the memory of Joe Sultana. All birds were handled and tagged by trained bird ringers under the licences of the local authorities (Environment and Resources Authority NP 20/16 and NP 0121/16). B. J. M. planned the study; P. L., M. A. and B. J. M. carried out the fieldwork; M. C. G. and A. S. B. L. analysed the data; M. C. G. drafted the manuscript; P. L. created the maps; all the authors were involved in writing the manuscript.